The past few years have seen a quiet revolution in stereo amplifier design, as we’ve witnessed a migration from one way of designing power amplifiers to another. The slow move from Class AB to Class D operation is significant for a number of reasons – arguably almost on a par with the move from tube to transistor in the great scheme of amplifier things. For many years, the natural choice for a do-it-all amplifier design was Class AB, where the output transistors are switched on (and then off) if and when power is demanded from them. This was a sensible way of putting electrical energy into your speakers, being a lot more efficient that Class A which kept the output transistors permanently powered up. Thanks to the lack of ‘switching distortion’, the latter class sounded cleaner, but drank power like it was going out of fashion and generated massive heat which caused its own set of problems. Then came Class D operation, using a completely new type of switching circuitry. The technology has been around for a while now, but early examples were certainly not very successful for audiophile applications, possessing an unpleasantly sterile sound. In the past decade though, we’ve seen some impressive designs from the likes of Lyngdorf (Tact), Onkyo, Flying Mole and NuForce. Large reserves of clean power and the conspicuous lack of that metallic upper-midband mush that most Class AB designs possess has made them a qualified sonic success. However, Class D’s detractors point to what is still a slightly matter-of-fact character and lack of tonal breadth. Now, Class D operation is finding itself in more and more audiophile arenas, to the extent that even the likes of Naim Audio – famous for characterful Class AB products – are using Class D in some applications. Japanese manufacturers have been particularly swift to adopt the technology. Efficiency is the main advantage – power is only dissipated by the output transistors during the very short interval between their on and off states. Also, because this instantaneous power dissipated is so low, smaller heatsinks and less robust power supplies are needed, meaning lower weight (and lower build and shipping costs too). Love or loathe the Class D sound, there’s no denying that it’s cheap and efficient. Many recent adopters argue that it’s not the low cost and light weight which has caused their conversion, but the quality of recent generations of chipsets. 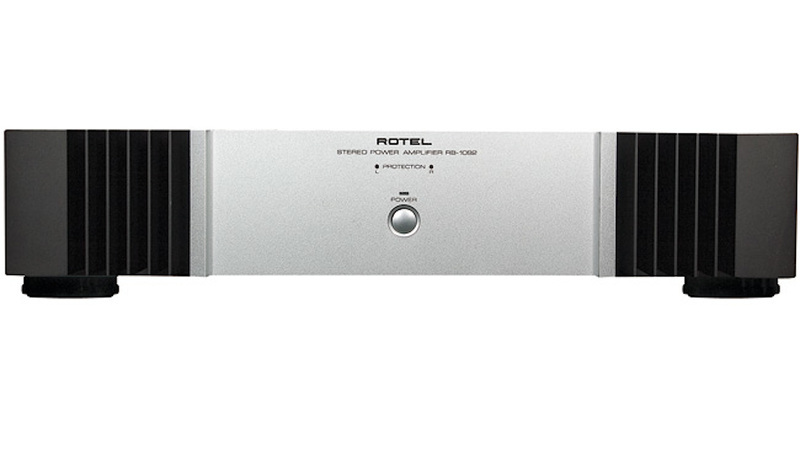 Rotel’s RB-1092 used the ICE power technology first seen on its RMB-1077 amplifier. At £1,595 in 2009 it was not cheap, but it promised a massive 500W per channel into 8 Ohms. There was also the RB-1091 monoblock design, retailing for just £995. Both were available in either silver/black, or black finishes. The Rotel turns in a very pleasant performance with massive reserves of clean power. Furthermore, it sounds smooth and even right across the frequency band. Bass is dry and strong and well articulated, midband expansive, detailed and dimensional and treble was crisp and clean. This is quite similar to the NuForce Reference 9SEs in this respect – the sound proving so agreeable that on a superficial level that it’s hard to criticise. Bass isn’t overtly imposing – the amplifier doesn’t keep reminding you of its barrel-chestedness – but is never less than strong and insistent. However, compared to the admittedly pricier NuForce rivals, it was a tad less tuneful. Midband is superb in a Class D kind of way. There’s oodles of detail, fantastic control and composure, impressive dynamics and a strong stereo soundstage, but vocals can sound a fraction too chilly for my liking. Not cold so much as dispassionate. Still, with its lovely taut and gutsy bass and smooth and expansive midband, the Rotel proves satisfying to listen to. It’s a musically communicative bit of kit – forget those early tales of Class D amplifiers sounding like the aural equivalent of watching grass grow. The Rotel is best suited to classical music. It is a taut, composed, tidy sounding design that has massive reserves of power, and this shows itself at lower levels by a lack of strain on crescendos. Debussy’s Prelude Submerged Cathedral was a perfect example of this – the Rotel hanging on Trojan-like as the brooding piano cadences got ever louder. This is its forte – it keeps its cool when most other power amplifiers around are losing theirs. Again, that expansive midband, bristling with detail, was a pleasure to listen to – the RB-1092 being subtle enough to capture every nuance and inflection of the playing. I suspect the half a kilowatt of power is too much for any normal mortal, but it’s the grace under pressure that the Rotel displays at lower levels than makes having this extra ‘cubic capacity’ under the hood worth having. It’s a genuinely svelte sounding bit of kit, capable of making very nice noises with even the most demanding of loudspeakers.